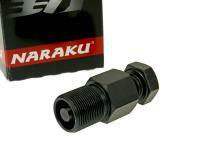 Naraku M18x1 puller for alternators on 2-stroke Minarelli-based and Minarelli AM engines. Screws onto the existing rotor thread and is tensioned with the tensioning bolt. Light taps with a hammer on the tensioned bolt help release the alternator. Note: CPI, Keeway and Chinese Minarelli-based 2-stroke engines use M18x1 or M27x1 left-handed threads (item 17438). Please check the diameter of the thread on the magnet wheel before ordering.